The BHS Winch Model Battery Transfer Carriage provides quick, simple, and safe battery extraction with a manually powered winch. This industrial battery extractor has an adjustable height that ranges from 5.5 inches to 23.5 inches (140 millimeters to 597 millimeters) to match the elevation of most common battery compartments. Users control the battery bed’s height with a powerful hydraulic jack system. Choose between two roller widths to match the size of virtually any forklift battery. The extractor arm secures to forklift batteries via hook-and-chain, while an easy-to-use hand crank controls the action of the winch. Welded rear handles improve portability. The Battery Transfer Carriage-Winch is a simple, low-cost solution for lighter battery handling applications. This unit was designed to remove batteries from industrial trucks for periodic maintenance, and is not recommended as a sole battery handling solution. For regular battery changes, use a BHS Operator Aboard Battery Extractor (BE) or a high-capacity model like the Mobile Battery Extractor (MBE). The Winch model features spark-proof poly rollers and large 6-inch (152-millimeter) phenolic casters. 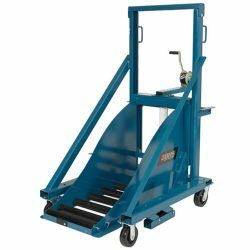 A heavy-duty vector floor lock holds the unit firmly in place during battery extraction, while the low-resistance casters provide smooth travel. Thanks to this effortless portability, Winch Model Battery Transfer Carriages make it easy to remove batteries from forklifts anywhere in the facility. Steel construction and a durable powder coating ensure long and dependable service, even in harsh industrial environments. Contact the BHS sales team at 1.800.BHS.9500 to learn more about the BHS Winch Model Battery Transfer Carriage, or to discuss custom options. Note: For maintenance use only.